Did Everyone Notice That Jered Weaver Is The Best Pitcher In Baseball Right Now? The younger Weaver, who has been sneakily good out for the better part of five seasons out in Anaheim, seems to finally be putting it into overdrive. His shutout last night moves him to 6-0 on the season, rarefied air for April. We know the season started early, and we know it's generally unadvisable to crow about any kinds of stats in April, but: wow. He's scattered less than a base runner an inning over six overpowering starts, pitching into at least the seventh inning in all of them. This is precisely the time in his career that Cliff Lee found another gear: near side of 30, couple years left on the contract. Big League Stew rightfully wonders who's going to open up their checkbooks after next season. 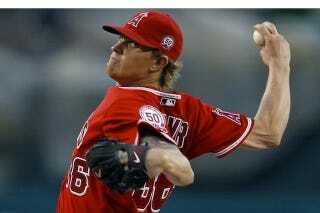 With all the talk about how it's another Year of the Pitcher, is Jered Weaver going to be the face of it? Or maybe it'll be Ian Kennedy. April stats, people, April stats.